Mrs. Evelyn Rosenkrantz has claimed in court that her dream to become the Queen of Holy City, California was reduced to ashes and bitter tears when the City’s self-anointed King, William E. Riker, retracted his marriage proposal. Evelyn is asking for $500,000 ($3.5 million USD 2007) in damages for breach of promise. The woman who would be Queen stated that William had sweet talked her in to posing as his wife. She said that they resided at a “love cottage” on 3679 Motor Avenue, Palms City. Evelyn was not the first woman ever to have been disappointed by William. About 20 years ago, he fled to Canada to avoid bigamy charges. It was there that the former palm reader founded "The Perfect Christian Divine Way”. To achieve perfection, devotees adhered to a strict credo of celibacy, abstinence from alcohol, white supremacy and communal living. To make it easier for his disciples to concentrate on their spirituality, Riker required them to turn over all of their money and worldly possessions to him. William and his followers returned to California and set up his “New Jerusalem” near Los Gatos. 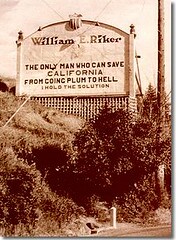 Surprisingly, he never got around to building a church in Holy City, but he did manage to construct a gas station (which sold “holy water” for over heated autos), restaurant, and an observatory where visitors could view the moon for ten cents. Located on the Santa Cruz Highway, Holy City became a tourist destination and was eventually bringing in over $100,000 ($1.2 million 2007 USD) annually. Tourists were lured by signs with such catchy slogans as: "See us if you are contemplating marriage, suicide or crime!" and "Holy City answers all questions and solves all problems!" Things went so well that the city incorporated. There would eventually be a Holy City Post Office, newspaper, and radio station, KFQU. The radio station would lose its license in 1931 for “irregularities” (maybe it was the call letters). Evelyn would lose her breach of promise suit, but she and William would tangle again in a couple of years. In the spring of 1929 Evelyn was serving a life sentence in San Quentin for being a habitual criminal (her final conviction was for passing bad checks in Oakland). She swore in an affidavit that back in 1927 she had witnessed Riker strangle a Mrs. Margaret White to death in the cottage on Motor Avenue. Evelyn told the court that Mrs. White was another of Riker’s abandoned wives. Nothing would come of Evelyn’s affidavit, and she likely spent the rest of her life in prison. Riker became known as “The Comforter” and made four failed attempts to become governor of California. He would be arrested in 1943 for his pro-German sentiments – he was writing letters of support to Adolf Hitler! Defended by well known attorney Melvin Belli, who constantly referred to his client as a “crackpot”, Riker managed to skate on the charges. The ungrateful crackpot would sue Belli for defamation of character, and lose. Riker made it to the ripe old age of 93, when he shocked his few remaining followers by converting to Catholicism shortly before his death in 1966. If you’re interested in owning a piece of California history, Holy City went on the market in 2006 with an asking price of $11 million. Maybe it’s still for sale.